What accounts for this divergence? One compelling theory points to the rise of executives' control over their own compensation, a problem of corporate governance recently highlighted by the case of Jamie Dimon, who holds the dual roles of CEO and chairman at JPMorgan Chase (JPM). This arrangement survived a recent shareholder attempt to establish an independent chairmanship following years of run-ins with regulators, which one shareholder claimed had cost the bank $16 billion since 2009; Dimon, who has no clear successor and threatened to leave the bank if he lost his spot at the head of the board, proved too strong for the insurgency. 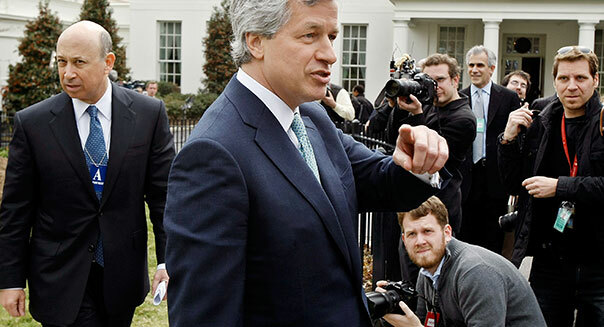 As Halah Touryalai observed at Forbes, "JPM has seen record profits for the last three years and not one quarterly loss during Dimon's tenure." Dimon isn't the only executive to occupy more than one top position at a company. Lloyd Blankfein, the best-paid banker of 2012, wears both hats at Goldman Sachs (GS); John Stumpf, who came in second, has the threefold title of chairman, president and CEO of Wells Fargo (WFC); and Richard Fairbank, No. 3 in last year's compensation ranking, is chairman and CEO of Capital One (CFO). "All of them are being overpaid," said Eleanor Bloxham, CEO of an Ohio-based board advisory firm, speaking to Bloomberg. "The bank boards still don't have a good handle on how they should be compensated." Maybe in part because those boards are chaired by the managers whose pay packages are up for consideration at meetings. Writing at The New York Times, Adam Davidson argues that excessive CEO pay is not a primary problem of U.S. business, using the example of Apple's (AAPL) late founder and savior: "[Steve] Jobs was worth an estimated $7 billion at his death, but he made hundreds of billions of dollars for his shareholders. Many now say he was underpaid." Even setting aside the exceptional nature of Jobs' performance, his example seems to undermine a standard premise of arguments in favor of huge CEO paydays -- namely, that prodigious compensation is required to retain the best talent. For Jobs stayed at Apple, a company he built and believed in, even in the absence of Larry Ellison-level pay. In any case, Davidson concedes that "a board tends to side with its chief," and concludes that the remedy is to empower shareholders to oust lax directors who fail to hold management accountable. Noting the result of the Dimon vote, ProPublica's Jesse Eisenger reaches the opposite conclusion: "Shareholders are part of the problem, not the solution." It can't be said that there's no connection between performance and compensation; Blankfein's tenure at Goldman shows some correlation. In 2007, he took home a staggering $68.5 million -- the record for investment banker compensation. After the bailouts, Blankfein's pay dropped to $600,000 in 2008, and $1 million in 2009 (still a relative pittance). It rebounded in 2010, however, reaching $25.6 million, but fell back to around $12 million after Goldman's profits dropped in 2011. But the relationship between CEO quality and salary is not always clear: This year, Blankfein lead the way among big bank execs with $26 million, despite job and compensation cuts at Goldman. In 2012, Dimon's pay was cut in half from the previous year, reflecting the $6.2 billion trading loss out of JPMorgan's London office (and a resultant Senate report saying the bank had mislead shareholders and regulators). He still got a healthy $11.5 million. The founder and leader of Capitol One (COF) earned $17.5 million last year. Bloomberg considers him the most overpaid bank CEO. No. 1 U.S. home lender Wells Fargo (WFC) had a banner year, banking a record $18.9 billion profit. Stumpf, who denies the existence of "a subsidy or unfair advantage from being perceived as too big to fail," took home $19.3 million. He currently chairs the Financial Services Roundtable, Wall Street's lobbying arm. Outside the world of banks, the U.S. Justice Department on Friday announced its opposition to American Airlines' proposed $20 million severance for CEO Tom Horton. The carrier, owned by parent AMR Corp. (AAMRQ), is merging with US Airways Group (LCC); Horton became CEO when American filed for Chapter 11 bankruptcy protection in November 2011. But even though American wants to give him all that cash, plus lifetime flight benefits, Horton won't actually be joining the ranks of the unemployed: The plan is to make him chairman of the combined company after the merger. As the Associated Press explained, "Bankruptcy law limits severance payments to executives and aims to make sure companies can repay as much of their debt as possible." The government's objection observed that, according to previous filings by American, Horton would have received at most $6.4 million if he had left at the end of 2012. Why so much more money now? American's board should have to explain how the $20 million figure was determined, the trustee's office says. And guess who the chairman is: one Thomas W. Horton. Bankruptcy court will consider the question on June 4.